(Fallbrook, California) - The Professional Numismatists Guild (PNG) and PNG member-dealer, Kevin Lipton, are jointly offering a $10,000 reward for information leading to the recovery of rare coins and paper money stolen from Lipton’s Beverly Hills, California offices. The unknown thief or thieves took more than a quarter-million dollars worth of numismatic items during a break-in on Sunday, October 19, 2008. “Anyone with information that can help solve this crime is urged to contact Detective Max Subin of the Beverly Hills Police Department at (310) 285-2158, or call the PNG at (760) 728-1300,” said PNG Executive Director Robert Brueggeman. Among the items stolen is an uncut sheet of six $10 notes from The First National Bank of Branchville, New Jersey that is believed to be unique. 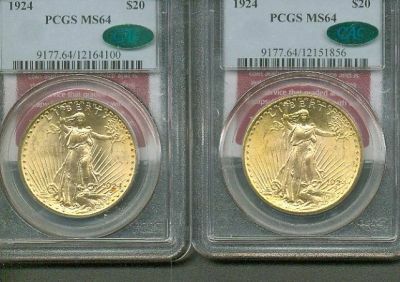 Seven MS-66 Saint Gaudens Double Eagles, graded by PCGS or NGC and each with a CAC sticker were taken: 1924 PCGS serial numbers #50241932, #06607136 and #50251605; 1926 PCGS #50135319; 1927 PCGS #21671348 and NGC #56810901; and 1928 NGC #65499304. 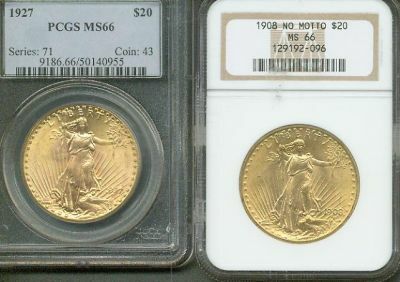 Other third-party certified coins taken in the burglary are 1904 $10 NGC MS-62; $20 gold pieces dated1907 $20 NGC MS-63; 1911-D NGC MS-65, 1922 NGC MS-64, 1924 NGC MS-66 and 1928 NGC MS-64; and between 600 and 800 certified First Strike-designated American Silver Eagles: 1991 PCGS MS-69; 1994 NGC MS-68; and 1999 PCGS MS-69. Several individual and sets of proof American Eagle gold bullion coins in government cases, 39 French 20 Francs pieces, and approximately 600 Canadian silver dollars dated 1935 to 1964 ranging in grades from Very Good to Choice Uncirculated also were stolen. An orange-matted and framed sheet of six notes from The First National Bank of Brandon, Vermont; four $20 notes and two $10 notes; and a box containing miscellaneous, low grade silver certificates and world bank notes. Founded in 1953, the Professional Numismatists Guild is a nonprofit organization composed of many of the top rare coin and paper money dealers in the United States and seven other countries. PNG member-dealers must adhere to a strict Code of Ethics in the buying and selling of numismatic merchandise. For additional information about PNG, call (760) 728-1300 or visit online at PNGdealers.com.